THE WEATHER’S GETTING WARMER – TIME TO BRING OUT THE HOT RODS AND GIANT LIZARDS!!! With the days getting longer and nicer, maybe you’re thinking about a nice cruise in that classic hopped-up hot rod on some nice straight back road. Sounds like a great idea – just watch out for animal crossing zones. Especially giant killer lizard crossing zones! A thing like that can really ruin a paint job! And that’s the basis for today’s cautionary tale of a ramblin’ reptile on the roads near a small Texas town as Beta Max TV presents THE GIANT GILA MONSTER!!! This 1959 sci-fi sizzler takes place in just such a location as we see a romantic couple having a little night-time romantic road trip through the uncharted wastelands just outside one of those small Texas towns. ‘Ceptin’ the fun ends pretty quick when a train size pink and black beastie decides to t-bone their car and have himself a little snack. Some townfolk think the couple decided to elope, but it was more of a gulp that made them disappear. 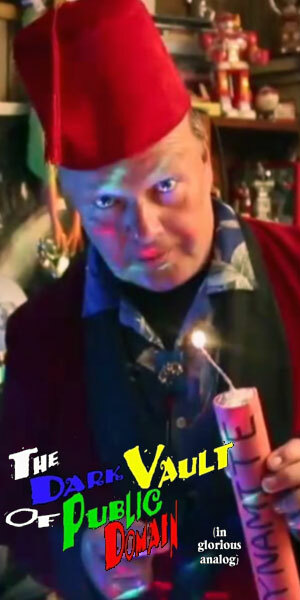 Chase Winstead, the town’s best mechanic/hot rodder/rock and roll singer organizes the fellow rodders to try to solve this mystery (with a little help from the sheriff) but not before a few other travelers turn into hors d’oeuvres for this renegade reptile. This movie stars Don Sullivan, a regular in several sci-fi/monster B-movies of the 50’s who, after leaving acting, actually used his college degree to work as a chemist in the cosmetics industry and just passed away at the age of 89 last January. Also featured in today’s epic are country singer/character actor Shug Fisher and France’s Miss Universe contestant for 1957, Lisa Simone. Produced by Ken “Festus Hagen” Curtis, it’s a frantic fest(us) of hot rods, rock and roll and a big stompin’ lizard! 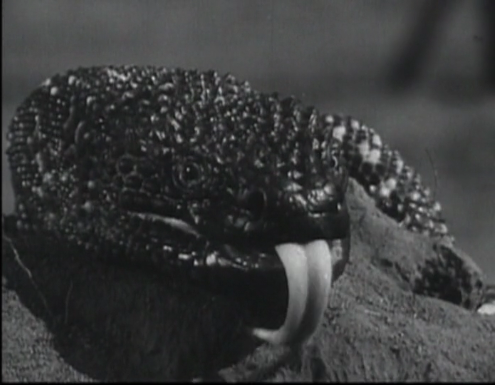 THE GIANT GILA MONSTER – today on your home for B-movies…and more – Beta Max TV!!! ← PINKY AND THE BOMB…AND A BOMBSHELL!! !